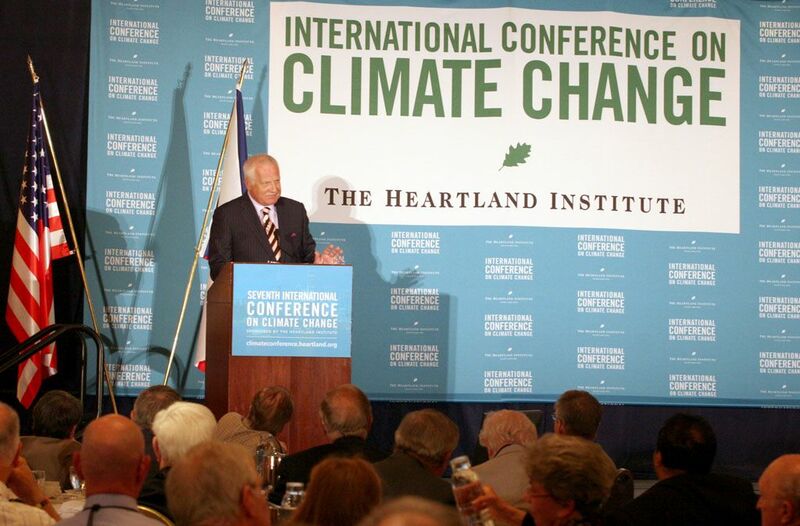 Text of Václav Klaus Heartland Institute Conference Speech | Watts Up With That? Let me, therefore, start by thanking you for keeping the global warming issue alive. This is an important achievement in a moment when it has already become half-forgotten. It has not happened accidentally, it was and is planned. It is a part of a carefully prepared tactic of global warming alarmists how to – once and for all – win their case. In the past two decades, they tried to do the opposite. They wanted to be as loud as possible to arouse our fears, now – when the whole issue becomes more and more suspicious – it is in their interest to stop any public discussion. This is the reason why they try to pretend that “the science is settled”, that the debate is over. We should not let them do it. Some of you may have a different experience. You may feel to be permanently under a very aggressive attack, but we have to admit that something has changed. Last time I was asked to speak about global warming was in July2011 in Australia. Of course, one possible explanation is that the audiences are no longer interested in my views on this topic (which is something I am ready to accept); the other explanation is that this experience of mine is not unique. The topics have undoubtedly changed. I am more often asked to speak about the Eurozone sovereign debt crisis than our global warming. It may also be the symptom of the victory of global warming fundamentalists who try to make the global warming debate forgotten. That gives this conference a special importance. Vaclav Klaus is a statesman, not a politician. Oh how I wish we had more of statesmen like him around at the present time. V.K has from experience seen what horrors can befall a nation when it succumbs to a leftist regime. I could not disagree with you more, Mr. Klaus! I found your speech very serious and extremely important. Winning the scientific battle will not automatically undo the social, political and economic damage caused by this artificial crisis. What good will it do us to proclaim we were right about the global warming scare, if we sit shivering in the dark, under a global energy dictatorship. One sane European voice. History will mark his bravery in standing up for science and freedom when others shamefully allied themselves with environmental advocacy for political expediency. His conclusion is unfortunately right. This is not and it has never been about science. It is part of the same ancient struggle that started long before the enemies of freedom and liberty got behind their CAGW battle cart and that will still be going on long after they chuck it for other war implements. It is important to understand but it is not news. Some people see farther down the road than others. It’s helpful to have a view such as this expressed by someone who sits at the tables of power. I’m hopeful the indoctrinated children will rediscover the 60s slogan – “Question Authority” – and begin to test the memes that have been embedded in their minds. A very astute political speech, as well as a realpolitik assessment of where we currently stand. Vaclav Klaus is my hero. A great man. I think it is important to keep trying to get more public debate on climate issues, especially those on policy and education. The ‘other side’ has won huge victories, and has had such an impact that there is a great deal of mess to clear up after them. Not least in the form of materials aimed at schoolchildren, and clearly intended to frighten them into compliance, or, as such materials often put it, into ‘taking action’ by which is meant ‘do as we say’ from a prescribed list. President Klaus has hit the nail on the head. As many of us have been stating for years. This isn’t a question of science. It’s a ideological battle. As a high school science teacher, I can safely attest that at the least, the teachers are indoctrinated (I don’t think there are any others in my department – about 12 of them – who seriously question global warming)(although many/most are fairly ambivalent about it). Students have been getting a lot of unbalanced information, but it doesn’t take much to get them questioning things (it helps that I’m just old enough to have been scared by the global cooling episode of the ’70s – I can pass that ‘alarm’ on to them as one basis of my current skepticism). Accurate & well-spoken speech. Klaus is a treasure. I just wish he and others who defend liberty would use the word “liberty” rather than “freedom.” The left uses “freedom,” and a gullible public believes that the left means “liberty,” when the left really means freedom from being responsible for one’s self; from having to provide for one’s own food, housing, and medical care; from having to make one’s own tough decisions, from having to suffer the consequences of one’s own poor decisions, etc.
. . . To sum up my today’s simple message: empirical data are important; scientific discoveries are important; the disclosure of malpractices in the IPCC and other “bastions” of the GWD are important; but we have to take part in the undergoing ideological battle. The subtitle of my five years old book was “What is Endangered: Climate or Freedom?” There is no doubt that it is all about freedom. We should keep that in mind. Gad, I wish we had a Presidential candidate who could echo this! Václav Klaus is absolutely right. The reason why there is not such hooplah about ‘global warming’ and ‘climate change’ is not because the AGW proponents have given up, it is because they think that they have won. The regulatory authorities have the AGW based regulations in place and continue to close industries; the taxation regimes set up with ‘green taxes’ are in place; Rio+20 knows what will be agreed,; and Agenda 21 staffers are just waiting for the probably already drafted AR5 ‘Summary for Policy Makers. If we could find just ONE! I’m hopeful the indoctrinated children will rediscover the 60s slogan – “Question Authority” – and begin to test the memes that have been embedded in their minds. I used to be hopeful, but it’s becoming harder. I’ve consistently engaged some of the younger crowd for the past few years, and although they THINK they’re thinking for themselves, they’ve been SO indoctrinated to accepting authority, that they can’t begin to question their fundamental premises. They just regurgitate what they’ve been told, accepting it as fact, while claiming to be skeptical at the same time. Do you suppose we could find a Hawaiian birth certificate for Mr. Klaus? I understand the point he’s making but disagree with him. Carbon credit markets and support for subsidies are being destroyed because of the scientific battle. This makes it more difficult for the activist to impose their will. The “scientific” claims of the alarmists were the foundation of their policy successes. Real science is eroding their foundation and will eventually bring an end to their power. My comment from a short time ago seems to have been gobbled up. Could you check on it for me? Thank you. Perhaps he’s had a change of heart? Wobble, I have to disagree – I wish I didn’t. Science can overcome scientific fallacy or scientific fraud; science cannot overcome politics. AGW was the horse that the centrists rode; that horse is dead but there is another mount in the offing, I’, sure. The damage to liberty has already been done and cannot be undone without positive and aggressive actions. Once again, President Klaus has demonstrated that he is one of the most gifted thinkers on the planet. Thank you, Sir for honoring and enlightening us with your words. I understood the point of the ICCC-7 talk of President Václav Klaus was that, although the scientific evidence against AGW is necessary for skeptics to win the dialog, the scientific dialog alone is insufficient. It is also necessary to win the ideological (intellectual/philosophical) dialog as well. When both dialogs are won by skeptics, only then can alarming AGW agendas be stopped. For me the problem is that most people have accepted the AGW argument as fact and just get on with the other things in their lives, leaving it to the politicians to do their thing. Without a very big AGW-busting “fact” that grabs the attention of MSM it will be an uphill slog to change the opinions of the general populace. i think the carbon market collapse was almost entirely due to obama’s failure to deliver the wealth of the usa to the third world via american cap & tax legislation. you know- the thing he and gore both got a nobel prize for but which didn’t pan out. the scientific claims had no merit. eroding those claims is addressing a mere tactic. post normal religion is reaching its culmination- it’s successful consummation. the strategy is barely delayed. look at your electricity bill or the gas pump or the grocery store. until the argument is explicitly focused on RIGHTS, there is no chance of bringing an end to their power. voting is what got you here and more of what made you sick won’t cure you. some folks don’t see the distinction between voting and prayer. some folks see the practical significance of voting or prayer as neutralizing any effective action. Suggest making the URL for Mr. Klaus’s website into a link and encouraging anyone not hell-bent on climatic totalitarianism to read his English Language notes. Yes, warmists will not debate the science. But using science (not IPCC GCM’s but science, as Lüning & Vahrenholt do in Die Kalte Sonne, with all its still unknown bits) is a great way to convince undecided people that the Greens and all the other parties taken over by warmist power lures are authoritarian bas4ards and thiefs. Thank you Mr. Klaus. With people like President Obama, former VP Al Gore, Senator Boxer, Congressman Waxman, etc. there is no hope the democrat party leadership will listen to, much less give serious thought to, Klaus’s words. However, I hold out some hope (not much, but some) for the Republican Party leadership. Are you listening Mr. Romney? Please stop our downward slide into socialsim, one important plank of which is the scam of AGW. “For me the problem is that most people have accepted the AGW argument as fact and just get on with the other things in their lives, leaving it to the politicians to do their thing. Your statement matches my experience. I see a certain person every now and then and the topic of the group always comes around to Global Warming. That person always has the same response: “Well, they say it’s happening”. It doesn’t matter what facts have been presented at this or any preceding meeting- it’s easier for him to just accept whatever is already planted in his mind than make an effort to find the truth. I’ve just returned from Germany, from a double seminar. The first was about an important scientific challenge to the Second Law of Thermodynamics (which I shall write up for Tallbloke’s Talkshop with the hope that Anthony here might run it, as it is well-done with many experiments and much data, and constitutes important evidence for Climate Science too, and experiments that I hope to replicate with a local science group). The second seminar was about proactively building peace. It was run by a survivor of fire-bombing in Hamburg in World War Two, whose experiences of devastation and disillusion taught him to take nothing on trust, either in life or in science. An ex-minister from the German government spoke on helping “third-world” countries and stressed the need for reparation for climate damage. So this evil corruption of Climate Science that we all know about at WUWT, still rules nice people’s minds in high places. I am going to try to disillusion him and Dr Graeff who ran the seminars, with regard to AGW. One can easily be lucid and well-informed and open-minded in one area, while ignorant in another. I’ve seen WUWT breathtakingly brilliant in loyalty to good science, sharp attention to what’s happening, and human warmth of approach allround, so that often my tears run with laughter or profound appreciation and sorrow. Yet WUWT is still frail with regard to breaking new ground scientifically, and for better or worse, one has to fraternize with the “transcendental ranters” at times, to open up the new science. I started a wiki for skeptics’ Climate Science, hoping to provide a gold standard to help right the Lysenkoism in which climate science teaching is still firmly gripped. Right now it’s resting because I cannot yet resolve how to combine the kind of writing / structure needed to put the corrupt science back on track, with the kind of writing / structure needed to protect the emerging new science from the bullying it tends to get here – while at the same time, holding up the standards of skepticism and rigorous testing that are needed and rightly demanded on the frontiers, but sometimes get short-changed by the “transcendental ranters”. “Slaying the Sky Dragon” should have been properly reviewed here but got short shrift because everyone focussed on the oddities – and then the alarming story – of one of its contributors, who was actually excluded from final publication. Yet it contains vital points. I wrote a skeptics’ introduction to Climate Science (click my name) – again to help allow the wellspring of knowledge run pure and uncontaminated again – but Anthony has never added it to his resources list, or said he would do so if I upgraded it so-and-so. Right now I want to get out a report on the Second Law which, I now firmly believe, needs amending, in order to correct a 150-year-old misapprehension which unfortunately put Climate Science on the wrong footing right from the very start. Looked at in this way, Climate Science never had a chance. And I want to give it that chance again. The world has enough problems to solve, without adding the problem of corruptions and blindness in Science to that list. We need a trustworthy Science to solve our problems. But trust only follows rigorous application of testing, with data and methodology open to all, Nullius In Verba. No we don’t, we can and must keep pointing out that they have created this religion on a hodge podge of impossible physics, that this does not describe the real world around us; we have to get this teaching chucked out, it is dumbing down science for the next generation. We should be trying to get NASA and the Royal Society and other science organisations which have become corrupted by this religion and its peculiar beliefs back to real physics teaching, and that’s not going to happen unless the fact that their basic AGW Greenhouse Effect physics is nonsense is made well known. Statesmanship is a rare quantity these days. I got a chance to view CZ in 1992 before everything changed. You could already see that the Czechs weren’t going to remain down forever. Clear thinking, and articulate, President Klaus is a perfect representative for that nation. Great piece thank you Anthony! Let me clue you guys in on something. The Question Everything crowd are now the teachers. They start their lectures with “Question Everything” then they supply all their own answers. The kids THINK they are questioning and thinking but in reality they have been indoctrinated by these addlebrained 1960s questioners. Our only hope is cooling which we all believe is coming. The bad thing is cooling kills people. Warming would actually make the planet habitable for 10 Billion people… which is also coming. are talkers. The Club of Rome are “doers” and the changes they have engineered are already in place at the UN. They no longer need AGW and so the focus shifts to “sustainability”. That’s the slogan Heartland should use as a riposte to the planned billboard ad touting the authority of the world’s National Science Academies over Heartland! The speech was pleasant to read and good points were made…. more months to wait… a bit more patience…..
Let’s bring up this point at the end of the year…. Here’s hoping there’s a sharp break in temperature and Arctic Ice trends. That would do it. Forget it. You could rather press blood from a stone. Hamburgers are the maddest warmists in the world. I worked there for 2 years in the warmist-solar industrial complex. It was big fun because those were the 2 La Nina winters – all of Hamburg was covered in ice and snow, and as they don’t have that in a normal winter they were utterly unprepared. And I was telling the warmists in the company every day that “it’s the sun, stupid”. They hated me. In 2011, Hamburg was the “climate capitol of Europe”; they got tons of EU dosh to create propaganda exhibitions, done by the local PR agencies, and dragged every schoolkid through everyone of them because schoolkids can’t run away. “Global warming? Isn’t it already over? Does anybody care about it?”. That is how they see it. Maybe, it is a European perspective. Down here (Australia) KV’s anecdotal observation applies: however, to the opposite affect. Politically the Greens through the blogging of skeptics/deniers (so called) and the introduction of a Carbon Tax by the Austalian Labor Party (a leftist government) are losing ground. The cost (waste) of the climate change agenda is hitting all levels of society adversely and people can now see that those polices are impacting severely on their standard of living. So much so that it appears that government will be swept from office at our next election. Voters care when the basis for their earlier support for “climate action” is steadily undermined by calm rational challenge to the environmental orthodoxy promoted by the Greens. Here more often than not nowadays when the question of AGW is raised the response is “Yeah, right! !” and the electorate is just waiting to demonstrate their anger at the ballot box. KV when speaking in Australia last year had a significant impact by pointing that liberty and the right to self determination was under attack By and through the AGW mechanism. It appears the game is up – thank God for him taking the time and making the effort to clearly set out the true agenda. What will science do to suppress the “sustainability” meme and power-push? Do search hit counts, etc., and watch that word run up its count as time goes on. What may hold it back is not science, but drilling. Natural gas, with its low price, super-abundance, and “low carbon” [spit], will undermine many of the claims and financial underpinnings of the push/putsch. I absolutely agree with everything you said and I challenge Anthony to treat her upcoming contribution with the scientific respect that it deserves. I will looking forward to it with eager anticipation. I’m sure he’ll eventually realize CO2 isn’t going to cause problems for the planet and stop worrying about it. However, it won’t be because of his teacher, but rather in spite of her. And by the way, I know his teacher and think she is doing a great job generally (math, reading, history, most of science, etc.). But as the official curriculum has the anti-CO2 slant and she’s stretched thin and probably hasn’t had time or inclination to delve into the issues herself, what is she going to do? Well, obviously she’ll follow the curriculum. Can’t get into trouble for doing that after all . . .
For me the problem is that most people have accepted the AGW argument as fact…. The MSM is bought and paid for. It is a propaganda machine and nothing more. The Thames could freeze solid, along with the Appomatox river in VA, and the Russian river in CA. There could be snow in Cario Egypt, Calcutta India, Hong Kong China and Cancun Mexico and thousands freezing to death and it all would still be blamed on CAGW and CO2. Vaclav Klaus is correct it has never been about science. It has always been about politics and money and power. The present-day institutional uniformity turned into a straitjacket which keeps blocking all kinds of positive human activities. The most important moment in this process was the establishment of the European Monetary Union and the introduction of one currency in a group of originally 12, now 17 countries that evidently do not form what the economists call an optimal currency area. The undergoing Eurozone sovereign debt crisis is an inevitable consequence of one currency, one exchange rate, and one interest rate for countries with very diverse economic parameters. The political decision, and it was a strictly and exclusively political decision, in favour of this arrangement was taken without almost any attention being paid to the existing economic fundamentals. 1. We have to get rid of the unproductive and paternalistic soziale Marktwirtschaft, “augmented” (which means further undermined) by the growing role of the green ideology. 4. We should stop the creeping, but constantly expanding green legislation. The Greens must be stopped from taking over much of our economy under the banner of such flawed ideas as the global warming doctrine. 5. We should get rid of the centralization, harmonization, standardization of the European continent and after half a century of such measures start decentralizing, deregulating and desubsidizing our society and economy. The EU is a comprehensive failure, and the Greens are trying to seal the deal. That right there makes the trip to Chicago worth it. Unless you correct the teacher she will keep teaching this nonsense, why not try getting her to think? But also, those teachers who do know it is nonsense are overwhelmed by the antagonism received if they object, from discussions I’ve read between them, and without outside support are unable to make a clear stand against this indoctrination. Parents against fake fisics.. they are teaching the children impossible fisics, of a totally imaginary world where visible light and not the invisible heat from the Sun warms the Earth, where there is no water cycle and where the atmosphere is not the heavy fluid ocean of gas above us, but the empty space of the imaginary ideal gas in a container in a lab.. It may have disappeared from view but the CAGW notion (i.e. cutting CO2 emissions) remains an almost exclusively EU project, likely to remain so and will probably contribute to its eventual collapse. Germany is already phasing out nuclear energy and Hollande intends a phaseout in France which exports power to Italy, Netherlands, Belgium, Britain and Germany. It’s just a matter of how bad things get before their governments face reality. Right now I want to get out a report on the Second Law which, I now firmly believe, needs amending, in order to correct a 150-year-old misapprehension which unfortunately put Climate Science on the wrong footing right from the very start. I hope you realize how nuts that looks. The “global warming issue” is an important one and must remain “alive” if we humans are to seriously, historically, and scientifically understand the changes all organisms have faced living on this Earth, during both warming and cooling. I agree with Dr. Havel about freedom (liberty) and respect his phenomenally successful career. However, with regard to “global warming”, the science is primary. WUWT and blogs committed to truth (no tampering with raw data or the means to gather it), transparency (show your data and your methods), and the scientific method (others can find the same result, too) have done more to undermine the CAGW schick than anything else (along with the financial disasters of solar and wind “power”). The real problem is the fantasy of authoritarian control of CO2, the stuff of life, which, if achieved gives the power of life and death over billions. The only test I know to see if the politics of this authoritariansm is declining is to follow the money. Track those billions (trillions) AND when they are severely limited for “government-bureaucratic” use (by parasites) and nagtural-resource energy development is returned to “the market” with reasonable pollution regulations (the stuff of life transformed for living well today), then and only then can we say change is afoot. (Note: the leaf vein study was funded by the government – NSF.) In the U.S., 2010 was an amazing beginning; I expect 2012 to be transformational (but step-by-step). Lucy Skywalker, I salute your efforts. I have not been happy when I have seen those from major California universities continue to shoot down (consistently, persistently, with derision) anything that challenges their control of the debate, whether in math or solar physics. Those universities have been and remain among the largest contritutors to the Obama (marxist-authoritarian)campaigns. Without federal funding in multiple areas (including massive “science” funding and tax-payer guarantee for student debt), they would cease to exist in their present forms. Let the professors/researchers struggle — like bloggers — to fund their own research, investigative efforts. Mr Klaus is a very astute man and it should give us all great strength that he has understood which side of this argument has truth on its side. This address to the Heartland conference is absolutely perfect– unassailable in its logic, blunt, and very brief. This is should be the goal of every public speaker. “We have to accept that they have succeeded in establishing the religion of environmentalism as the official religion of Western society, as the religion which asks for a radical transformation of the whole Western civilization. We – at least some of us – have to play with them in the arena chosen by them.” Definitely true. Obama goes with the rebranding to clean energy and a potential GOP VP nominee, Chris Christie, has been on record as a believer in CAGW and the need to do “something” about it. Environmental religion explains a lot about what goes on in schools, the press, government – everyhwere publicly, – and how people can be non-alarmist and still be dominated by enviro/ climate policy. Exposing it as religion is not enough if we still feel it is the right thing to do. I prefer the arguments that it is not the right thing to do using examples such as allowing a narrowly focused green worried only about “harm to the environment” to manage an energy company let alone an energy policy. There is hope that environmental religion can be discredited. The mother of the problem, the one of “informed authority” – consensus scientist / activists (you can’t be a scientist if you’re an activist) – exercising the levers of power is ongoing since the days of flat earth to witch burings to blocking DDT thereby killing more people than Hitler, Stalin, Mao and Pol Pot put together, to CAGW requires constant vigilance. The answer is humble science to which the Royal Society and the National Academy of Sciences are dedicated against. Ahh, dear Vaclav, a true statesman and a true democrat. He spoke to the EU parliament, and called for a viable opposition within the parliament, because democracy cannot succeed without an opposition voice (the EU parliament has no opposition party). He reminded the EU, that he had lived under a ‘parliament’ with no opposition, it was called Russian Communism, and it was repressive and undemocratic. In a demonstration of the true fascist nature of the current EU, the parliamentarians booed him at the absurd suggestion that they should be democrats, and walked out. The EU shares many characteristics with the Global Warming movement. Thanks. I am indeed nuts about the whole project. The experimental work that’s been achieved excites me, and it’s to the shame and eventual loss of universities that they won’t even look. Heck, careful, thorough, engineering-standard, openminded observation, plus developing maths and theory that fits the results, is what Science is supposed to be about. Isn’t it? Look at Faraday and Maxwell. Faraday did the experiments, Maxwell fitted the equations. What makes you think I am talking about anything so very different? And don’t you think I have studied the formulations of the Second Law, and the reception which people get when they talk about the Second Law? Try this. Smoking Frog: I should have added, this. I’m just surfing to keep uptodate, while preparing a proper new piece on Graeff’s experiments and the replication work I hope to carry out. I need time to get it right. But yes, I am nuts, and happily so. I’ve been passionate about standing up for integrity in a cadet branch of Science that has gone seriously wonky. I never dreamed I would find myself at the cutting edge of new science or that it would turn me on and excite me like this. Lucy – isn’t the key word in the 2nd Law “spontaneously” – i.e. without work being done? Gravity, afaik is not considered not work in the 2nd Law, i.e. work is being done – as for example, in the atmosphere – temperatures decrease with height regardless that there is the cycle of heat rising/cold descending in the expansion and contraction of gases within that; gravity pulls mass, which is what gives different weights of gases relative to each other, and pressure of contraction means greater kinetic energy, so hotter at bottom than at top. Is not breaking the second law because it isn’t spontaneous, it is gravity induced. The second law is that heat always flows spontaneously from hotter to colder. They’ve just proved the law, yet again..
Lucy Skywalker: OK, I must admit it’s interesting. No. A gravity-fed heating system merely relies on gravity to return cooled water to a heater that is at the bottom of the system. It does not use gravity to heat the water. Myrrh: If a gravity-fed heating system used gravity to heat the water, this would be well known to people, since it would reduce oil and gas consumption. Always ask yourself: If proposition P is true, what would the world look like? Smoking Frog – have to admit I didn’t read it properly – was in a bit of a rush, so thanks. However, my point re the 2nd Law is that it is a statement of heat always flowing from hotter to colder spontaneously, without work being done, gravity is work being done; in other words the law does not have to be re-written. Gravity heating. There isn’t heat flowing from colder to hotter, but cold air being heated up by compression, which is work, which is not what the 2nd Law is saying. Those who instigated the fake fisics tweaking to promote man made global warming claims about carbon dioxide have so screwed education by this that people now believe all kinds of impossible things, that gases in the atmosphere can’t separate out, that light not heat from the Sun heats the land and oceans, that our atmosphere is empty space, and so on. There are two main AGW memes about the 2nd Law. One is the line that Spencer takes, that heat can flow from colder to hotter and that this will in turn heat the hotter more, and the other that heat exchange is a net giving hotter to colder by including heat travelling from colder to hotter; the first I’d like incorporated into my heating system (as I would carbon dioxide..), and the second having no mechanism to achieve this ‘net’ from hotter to colder will, as someone told me in a discussion, mean I can leave a lump of raw meat in my igloo and go off hunting for a few hours, to return to a cooked dinner. The reason this is confusing is because the tweaks are from the range of science disciplines, and someone familiar with one and able to see one tweak in his field, will more often than not fail to question the other ‘basics’, instead thinking that ‘common knowledge’ about them is because of well established empirical fisics when it is actually more tweaks made ‘common knowledge’ by such tweaks being introduced into the education system. For example, the tweaked physics which gives the AGWScience Fiction world of an atmosphere as empty space is achieved by substituting the properties of ideal gas for real gas, so they have no convection, no weight, volume or attraction, gravity in a heavy fluid gas medium, only radiation in empty space – how many of those now educated to think the Air around them is empty space with molecules of the imaginary ideal gas zipping around at great speeds bouncing off each other will ever be confronted with how sound works in the real world? How many of those will see the disjunct? They can’t even see the Water Cycle is missing from their comic cartoon energy budget.